If justice was awarded for courage alone, Anna Politkovskaya, the late journalist who seemed most comfortable reporting from an exploding battlefield, would have been vindicated long ago. But for now, Politkovskaya, who was gunned down in the entrance of her apartment building on October 6, 2007, will have to wait another day for justice as the jury in her sensational murder trial handed down a not guilty verdict to the defendants. Sergey Khadzhikurbanov, the Makhmudov brothers, Ibragim and Dzhabrail, and former security agent Pavel Ryaguzov have been found not guilty as the prosecution, according to the jurors, failed to produce incriminating evidence against the defendants. Former FSB employee Pavel Ryaguzov, who was accused of exceeding the powers of his office and extortion, pledged to help find those responsible for the murder even if he had been found guilty. “This will now be my life’s work – to find those guilty. And either from jail or from a penal colony, I want some people to apologize, and I am sure that will happen,” Interfax news agency cites Ryaguzov as saying. Although the prosecution has said it would appeal the decision, it seems that the full weight of the investigation will now fall upon the third Makhmudov brother, Rustam, as the man who pulled the trigger. During the trial, it was revealed that the killer carried out the assassination for $2 million. He has been placed on Russia’s wanted list and is believed to be living in hiding in Western Europe. If found guilty of the murder, Rustam could expect to spend life in prison as Russia maintains a moratorium on the death penalty. For the prosecution in the high-profile murder trail, the road has been uphill all the way. The most significant piece of evidence that was produced was connected to alleged cell phone conversations between the Makhmudov brothers allegedly before and after the murder took place. Defense lawyers Said Arsenezayev and Murad Musayev said that the phone records are inconclusive. “It’s all they have. They have nothing else,” Musayev said following a court appearance in December. Meanwhile, the defense lawyers said that no audio records of the alleged conversations between the brothers were kept. The brothers maintained throughout the trial that they do not remember what they were doing on the day of the killing. Known best for her relentless coverage of the atrocities of the Chechen war from both sides of the trenches, Politkovskaya did not limit herself to war correspondent. On the evening of October 23, 2002, about 45 Chechen terrorists seized the House of Culture Theater in central Moscow with 850 hostages inside. The perimeter of the theater was rigged with explosives and the terrorists clearly had no intention of leaving alive. 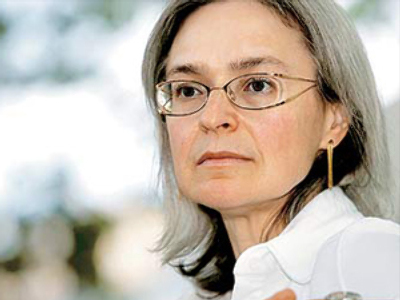 Anna Politkovskaya was one of the few people permitted inside of the building in an attempt to negotiate with the terrorists. Although the talks were essentially fruitless (after a dramatic two-and-a-half day waiting game of cat and mouse, Russian Special Forces finally stormed the building, rescuing 721 of the 850 hostages and eliminating the terrorists), Politkovskaya proved her mettle by voluntarily exposing herself to the gravest danger in an effort to save human lives. In many ways, Politkovskaya’s desperate talks with the theater terrorists showed her star shooting full circle. 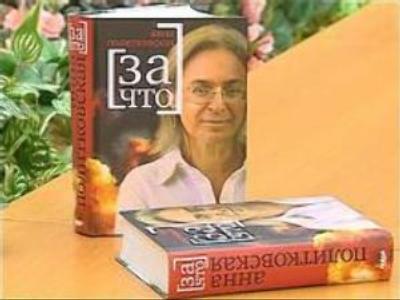 From something of a human rights vigilante with a pen that scribbled like a sword (sometimes a bit too haphazardly, however, as her many critics would counter), to acting as a negotiator between the warring belligerents in the Russian capital, Politkovskaya witnessed the full spectrum of hostilities that rocked Russia for many years. Such heroism certainly deserved better than a coward’s bullet in the back of the head inside of an elevator while bringing home the evening’s groceries. But on October 6, 2007 that is exactly what happened. Politkovskaya was found dead by neighbors with the assassin’s handgun lying next to her, the trademark signature of a contract killing. What initially followed was a flood of condemnation aimed against Russia, specifically from Western quarters, condemning the journalist’s murder as an attack on media freedoms. However, as has been the case so many times in the past (In October, for example, Karinna Moskalenko, a lawyer for Politkovskaya’s family, told police in Strasbourg, France that she had discovered balls of mercury inside of her car. The media quickly jumped on the story as if it were an open and shut case against the Kremlin. But when it was soon revealed that the previous owner of the car had broken a barometer on the back seat, the silence from the media was almost deafening), this story was not so cut and dry. Indeed, it could be argued that the journalist’s most memorable work ended with the hostilities in Chechnya. Now, given the outcome of the murder trial, Russia should hope to receive a high level of cooperation from officials in Western Europe to apprehend the top suspect, Rustam Mukhmudov, in order to bring this dramatic case to a close. But if the history of turning over recognized criminals to Russia – from Europe and beyond – is any indicator, justice for Anna Polikovskaya may be many years away. Politkovskaya trial: prosecution case unravelling?